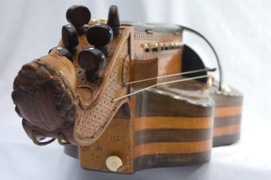 The hurdy gurdy has existed in one form or other for at least a thousand years. It has two or three melody strings and four or more drone strings. All the strings are played by a wheel, which is turned by a handle on the end of the instrument. Some hurdy gurdies also have sympathetic strings. As with the nyckelharpa, the melody strings are stopped by tangents, which press against the strings to change their pitch. The drones are tuned in fourths and fifths and one of the drone strings, the trompette, runs across a tiny loose bridge which buzzes when the player provides a rhythmic impulse to the wheel.